This is so COOL! What is it? Brilliantly fun, inspirational and entertaining interviews on talking with animals FREE mini training series! Join an unprecedented, collaborative joint venture based on my mission of reaching and teaching One Million animal lovers around the world how to talk to animals. I’m interviewing the BEST professional animal communicators and pet psychics in the world, asking them how they got started, what they’ve learned and what they can teach YOU right now to help you with your animals. 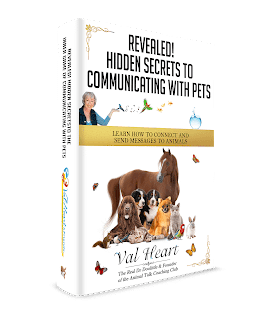 In each unique interview, you’ll learn more about using animal talk to solve pet behavior problems, enhancing training and performance issues, helping animals heal, about easing transitions, finding lost/missing animals, and reconnecting with pets in the afterlife… and SO much more. Our first interview is with professional communicator colleague, author, spirit medium and certified VortexHealing® Divine Energy Healing Practitioner, Philippa Kingsley from England. We had a great time discussing our favourite topics, Animals, Healing and the Magic of Communication. Register now for the Show and then leave a comment for us, okay? We really do want to know what’s on your mind. Click Here to Sign Up for this Amazing Series of Interviews! <> Please, don’t keep this a secret! Tell your friends!